It’s my oldest daughters 9th birthday! Or as I say it, my Mom-iversary! I love all birthday’s and parties, but my oldest’s birthday is always something special, I became a mom with her and have loved it all, the good, the bad, the fun, the sad. BUT pinning her down to a theme was hard. When asked what her favorite color is she says “all of them”. 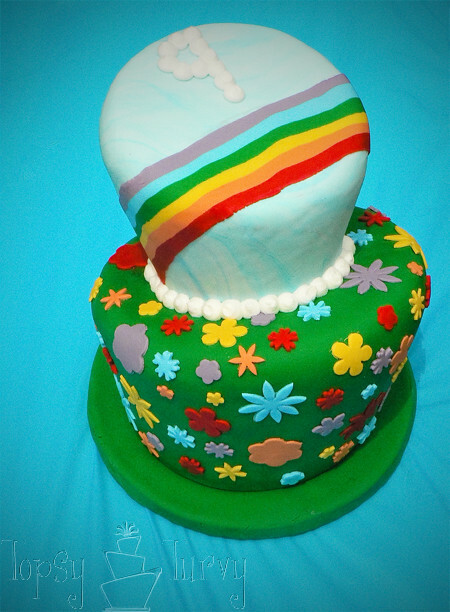 So going with a rainbow was perfect. She also love gardening. So a rainbow garden theme it is! For the cake we wanted a rainbow of colors. 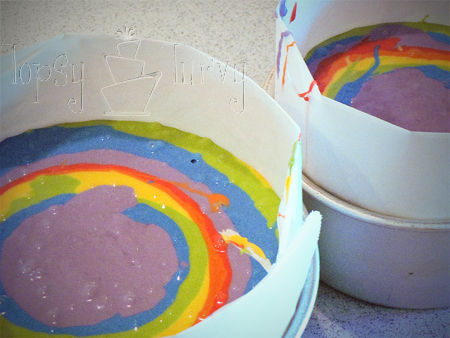 So after I made the batter we separated it out into all 6 colors. Well FIRST we has a conversation all about what was technically a color. If black is all the colors, and white is the absence of color then what is grey? Also if you can make orange, green and purple are made from the primary colors are primary colors the only TRUE colors? This is the type of stuff that my Sweet little Aspie (nickname for Aspergers, it sounds sweeter and easier to say and type) brings up on a daily basis. I should share some of the stuff she talks about on the way to and from school! 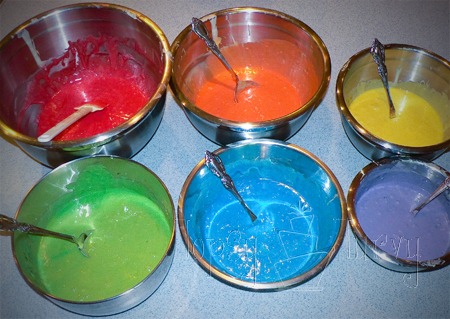 ANYWAY… Once you have your colors separated you want to pour them into the cake pan. You’ll see the parchement paper I have wrapped around the edges? I have 3 inch tall pans, but I like my cakes even taller than that for carving so I take a long sheet of parchment paper and fold it, lengthwise into thirds. Line the pan with it and you can pour your batter all the way up to the top and it won’t spill over and you’ll get a taller cake! 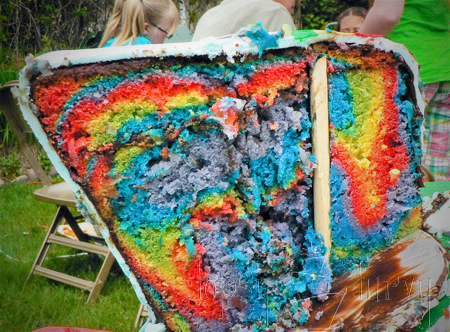 So take your first color and pour it right into the center. I poured about 3 cups in. Move on to each color in turn, making sure to pour right into the center! You can do less or more depending on what look you want. I went through the rainbow twice! So here is what it looked like inside! Is that fun or what! Of course I used so much coloring that diaper changing has been, well, colorful! It looked and tasted great! and in the end what else matters? Nothing! But looking super cute doesn’t hurt!